This group is for trainee pharmacists to discuss ideas and work together. The group may be used for exam preparation, members may post calculation and general questions relating to the exam. This can be answered by pharmacists or other trainee pharmacists. Members can also share career opportunities with eachother. Any pre-registration pharmacist still looking for placements please get in touch. We currently have a 100% pass rate. What to do if you are having or facing difficulties during your pre-reg year? 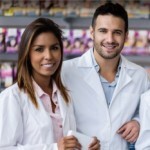 Clockhouse Pharmacy Iin Romford is offering a one year fixed term contract to meet the requirements of the General Pharmaceutical Council in order to register as a pharmacist.